We are excited to report that an anonymous benefactor has endowed the Eikenbary-Pierce House project with an early-model Mercedes-Benz 300D. This will provide comfortable, efficient, and reliable transportation for crew, benefactors, and visitors. This is not the first time an anonymous benefactor has stepped forward to help complete this project. With these generous souls on board, the final result will be magnificent – and it will happen much sooner! Why do we love this car? 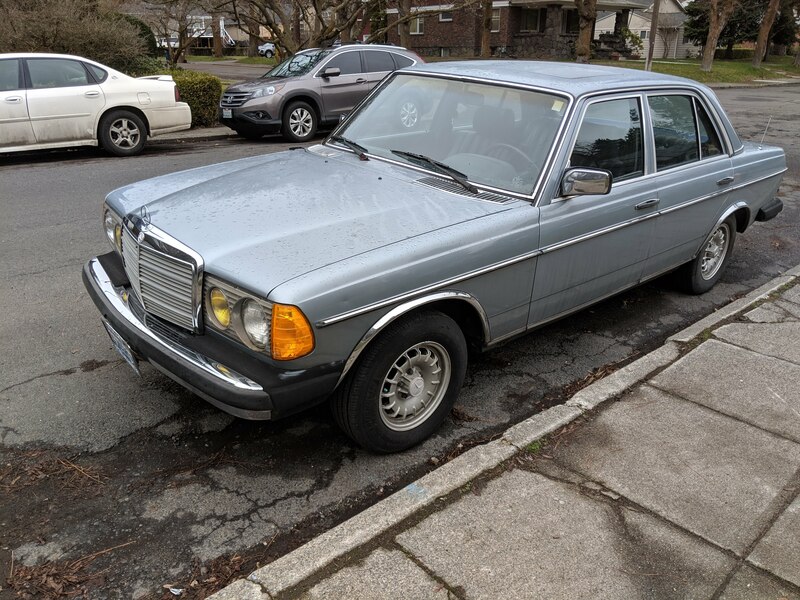 The Mercedes 300D was manufactured in the early 1980s, shortly after we came “of age.” These automobiles are still in use all over Europe as taxicabs because of their amazing efficiency and reliability baked in to a rather simple design. It’s hard to overestimate the impact this conveyance will have on the EPH project. 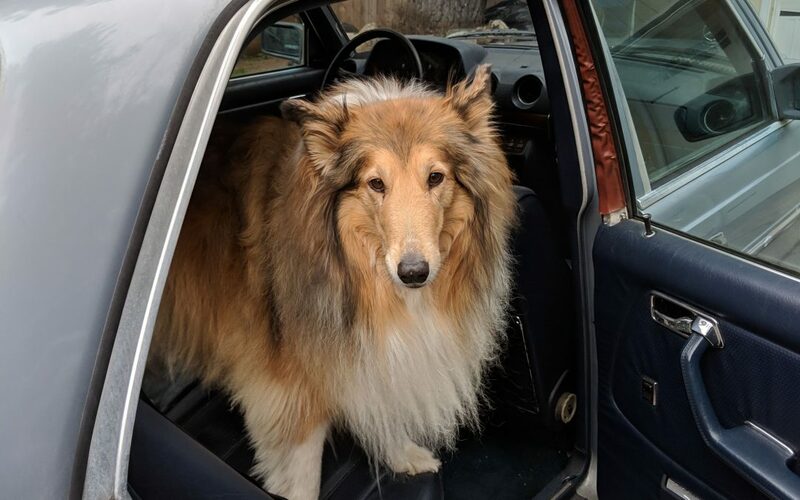 Over the next few months, we expect the 300D will reliably convey many people, furry animals (see photo), and small parts as pace of the project picks up again over the spring and summer. We already find it much more convenient and economical to use than the project work truck for many expeditions. 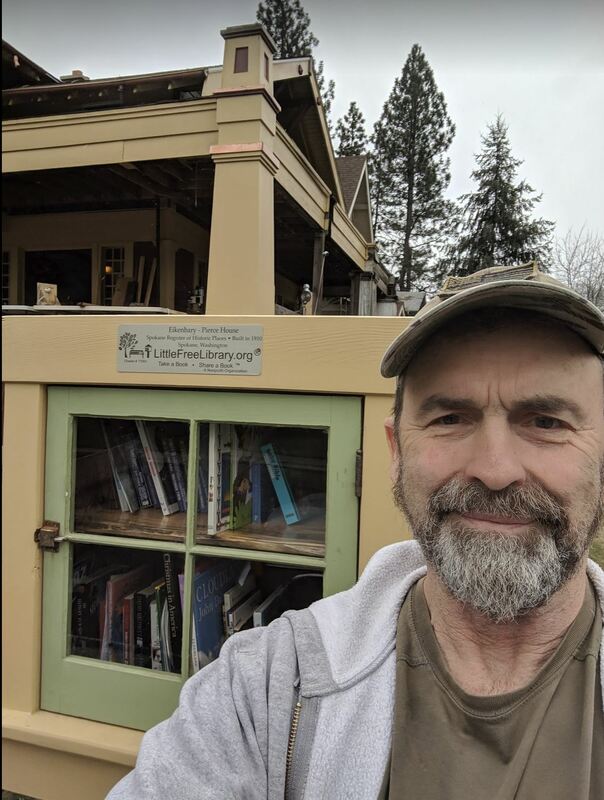 We have made the first run with the 300D to pick up the books donated by a friend of Eikenbary-Pierce House, Julie Wilson of Busy Bees Daycare in Spokane Valley. 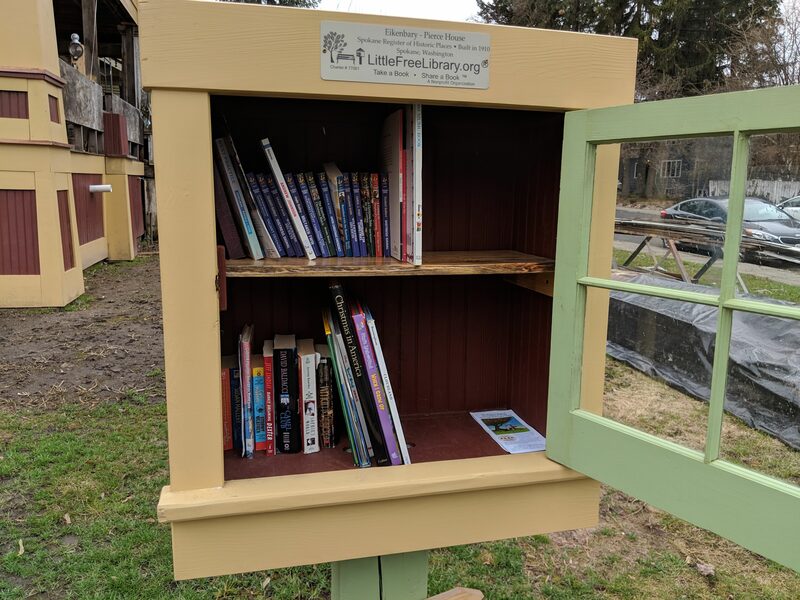 We placed the books in the Little Free Library at the project site. 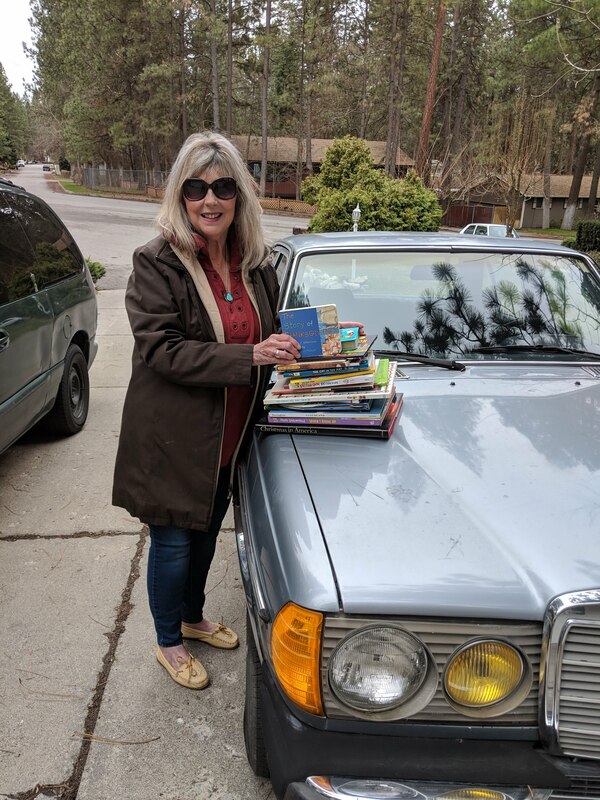 Julie provided several high-quality children’s books and we are confident that they find a new home soon with our friends in the community. “This is great, I had an abundance of books, and I’m glad they will be going to the neighborhood families,” said Julie. PLEASE NOTE: For those interested in Eikenbary-Pierce House-era artifacts, we plan a large sale of vintage items found at this historical site in the next few weeks. Proceeds will directly benefit the construction. Please subscribe on our contact page for notification, or give us a call at 509-218-2248. Hello out there glad to have you onboard…. New EPH Newsletter Is Coming! Charlotte on A Little Free Library Is Born!